The Holy Synod of Bishops of the Orthodox Church in America will be held at the Chancery here from Tuesday, March 17 through Friday, March 20, 2015. 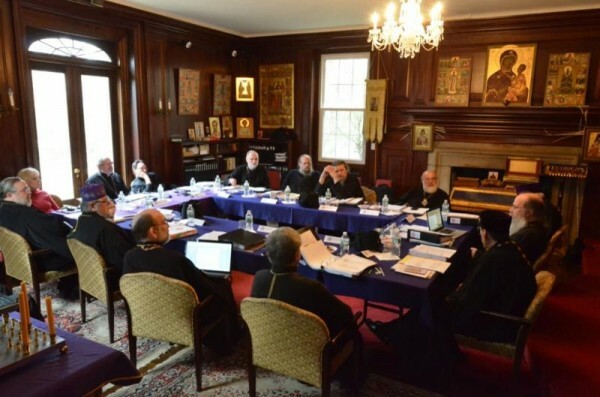 According to Archpriest Eric G. Tosi, OCA Secretary, the members of the Holy Synod will undertake a thorough review of plans for the forthcoming 18th All-American Council, slated to be held in Atlanta, GA July 20-24, 2015. They will also consider the nomination of Archimandrite Gerasim [Eliel] as Bishop of Dallas and the South and review materials related to Archbishop Seraphim. Synod members will offer reports on their respective dioceses and review recommendations for Synodal clergy awards. Other clergy, canonical and legal matters will be discussed. The Statute Revision Committee will present a report on its activities, while updates will be offered by the OCA’s officers. Reports on external affairs, SMPAC and ORSMA will also be heard, while the Board of Theological Education will meet to discuss candidates for ordination. As part of the ongoing rotation of departmental reports, presentations will be offered by the Philadelphia-based Russian Brotherhood Organization and the Fellowship of Orthodox Christians in America.